Preorder is live for our forthcoming book! It’s called Craft Beef: A Revolution of Small Farms and Big Flavors. Today, we want to tell you more about this whole “craft beef” thing. What it means, what it is, why it’s great, why you should care, why you should eat it. (n) Beef produced by small-scale, independent producers that seeks to meet a high ethical standard and above all else prioritizes unique flavor. You’ve probably heard of craft beer. (In fact, you might have at first read ‘craft beef’ as a typo for America’s favorite hoppy beverage. But it isn’t!) You also may have heard of craft chocolates, or craft coffees; or perhaps right now your mind is jumping to wine -- the roses, the whites, the Syrahs, the Burgundies of many vintages. You’re on the right track. So how is craft beef similar to those foods? How is it different? I want to walk you through an analogy between wine and coffee. But before that, even, first we have to back up a couple steps, because in order to understand how beef could’ve gone craft, you first have to get the story of beef in America. The implications of industrialized beef are stark. Gigantic feedlots, a travesty for, land, groundwater, and the tens of thousands of cows that live in them, cause health problems for cows ranging from stress to acute acidosis to respiratory diseases… due to constantly standing in manure and breathing it in 24 hours a day. Big Beef causes a litany of other issues, too, from price-cutting small farmers to the unfolding antibiotic resistance crisis. But there’s a less-discussed and much more surprising impact of industrialization -- and that’s the impact on the taste of beef. The main goals of the commodity market, from the perspective of the beef companies, are keeping costs low and marbling -- the USDA’s only current metric for meat quality -- high. Those priorities have pushed Big Beef down a path lined with cheap, subsidized, high-calorie grain feeds. Along with growth-promoting agents, antibiotics, mechanical tenderization and injected solutions, those cheap feeds lead to uniform taste. That 90-300 day period on the concentrated feedlot effectively wipes out whatever variability existed between the Angus-Hereford and Angus-Charolais cows when they plodded through the gate, having just arrived from opposite corners of the country. The flavor that comes out the other end of a feedlot isn’t distinctly terrible, but it is exactly what makes Grandpa say, “Beef just doesn’t taste like it used to.” The most distinguishing feature of most American beef these days is its sameness -- one steak to the next is, for all intents and purposes, interchangeable. But as we tasted our way across small, quality-focused farms in America and beyond, we realized that there’s something very, very different going on in the farms and fields beyond commodity beef. 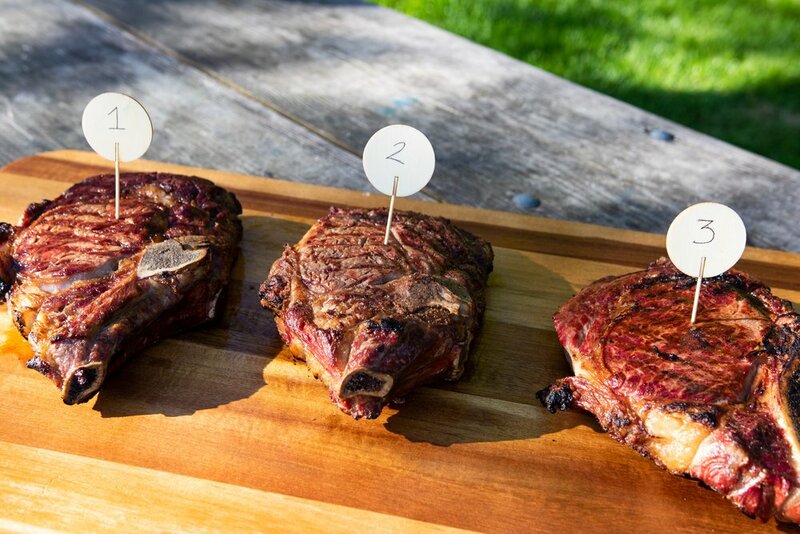 On craft beef farms, where independent producers reign and are striving every day toward unique taste, steak flavors can vary just like wine, coffee, microbrews, or chocolate. So, now to a useful analogy. Let’s look at wine. Wine lovers have long known that the mineral content of soils, the grape varietal, the weather, the season, the fertilizers or other inputs, and the handling by the farmer all make for distinctions in flavor, texture, and mouthfeel of that delicious swig. Well, you can take all those same variables, apply them to beef, and add the fact that each steak, unlike each glass of wine or beer, was formerly a living creature during whose life a million things could have happened -- good days, bad days; a stressful cow break-up (only half-kidding), extra snacking, too little snacking, autonomous decision-making! -- and you get an inherently more complex equation than wine. In a way, all of this is pretty intuitive once you start to think about it. But it took us getting invited to a taste test of different kinds of Wagyu -- that Japanese cattle breed prized for its rare umami flavor and marbling ability -- for it to click into place that one craft steak must certainly taste different than the next. This was in the early days of Crowd Cow. We knew enough at that point to understand that grass-finished beef typically taste different from grain-finished beef. But we were about to taste a wide spectrum of grain-finished Wagyus. We didn’t know quite what to expect, but were sure we would learn something. What we found, to our distinct surprise, is that that there absolutely differences between different varieties of grain-finished Wagyu. The A5 Wagyu from Japan had a buttery richness unlike anything we’d ever tasted before -- like the beef version of foie gras. It occupied one extreme end of the spectrum, sitting wholly apart from the others in both flavor and texture. The Fullblood Wagyus, which were the same breed and were all raised on a grain diet -- but unlike the Japanese Wagyu were raised on pasture in the United States -- even registered minute differences between one another. In general they had a much stronger “beefy flavor” than A5 Wagyu because they had used their muscles so much more every day of their lives, but some were more buttery (sliding toward Japanese A5), some coarser and more beefy (sliding toward the grass-finished Purebred Wagyu). Beef isn’t a commodity -- not by any account. It’s as complex, nuanced, and scrumptiously differentiated as wine, and probably much more so. To keep reading, preorder Craft Beef!